Your bedroom that part of your house which is your personal sanctuary where you come at the end of the day, rest rejuvenate, spend some quality time with your family and yourself and get prepared for the next day. This is your very personal space that must reflect your personality and aesthetics. It is only then that you will feel completely at rest in your bedroom. Ideally, a bedroom décor must be a fine blend of style and comfort. 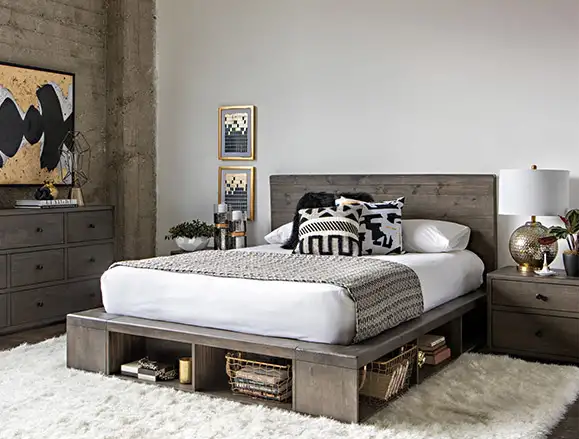 In the course of this article, we will be discussing five interesting ideas that can be employed to make your bedroom additionally attractive and stylish. Use Of Colored Walls – One of the marked features in the latest bedroom designs of the contemporary times use of colored walls is a much prevalent idea. This is a bedroom décor trend that helps to give a character to the room. This is also an interesting way through which the room can be made to look bigger and more spacious. Ideally, a bold and contrasting color is given to a single wall that adds a note contemporary style to the entire room. The other walls are given a muted and lighter color. Ideally, the wall that is given the brighter hue is often in full display and not hindered by furniture or windows and doors. Use Of Contemporary Furniture – There are several brands of furniture and lifestyle products that are available in the market. These furniture pieces are designed so that lighter, space economic and stylish furniture can be used to decorate the room and to make the life of the inmates more comfortable and convenient. The aim of these brands is to offer your furniture and lifestyle pieces that will be stylish to look at and also of durable quality. Colors And Tones – Colors and tones can do wonders for your bedroom looks. While working for small bedroom ideas designers often go for brighter and lighter colors. This gives a spacious look. You can also think of colors and tones on the walls and the floors. You can add textures of warm wood or that of steely grey that can add more character to your room. The floor tiles, the colors of the doors and the windows, the nature of the upholstery and accessories can also add to this parameter. Try to go for strikingly contrasting pillows and cushions for your beds and comforting chairs. Doors And Windows – You can also extend the length of your windows. Floor to ceiling windows adds a different charm and glamour to your bedroom décor. Additionally, you can also add sliding doors to your room that will help your room look more modern and contemporary. Electrical Fittings – The electrical fittings of the current times also receives as much importance in the designs of your bedroom décor. Wall mounted lights, concealed ceiling illumination, and other modern electrical fittings can contribute in making your bedroom look smarter, stylish and more contemporary than ever. The above-mentioned ideas can not only make your bedroom look more modern and stylish but will also improve the space content, furniture placement, illumination and airing of your room. These, in short, can help you live better in your personal space.